Now your little one can be super happy when you get them this Toy Story Woody’s face t-shirt. You can get this Toy Story kids t-shirt in sizes 2T – 5 and all are made from 100% cotton. 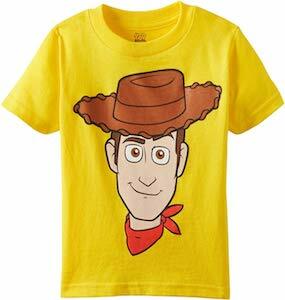 The t-shirt is yellow and on it you can find the head of Sheriff Woody complete with his brown cowboy head on his head and a red bandana around his neck. 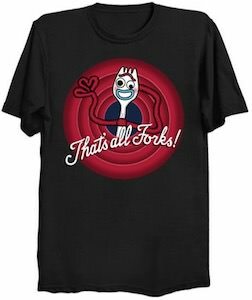 I am sure that if your child loves Toy Story then this is the t-shirt it wants to wear everyday of the week. A Toy Storyt-shirt makes for a fun present for birthday or a special occasion. If you want fun socks then you have to check out these women’s Toy Story socks. 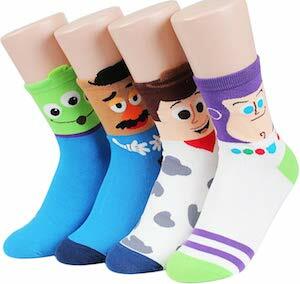 These socks come in a set of 4 pairs and each pair has a different Toy Story character on it. You can find Alien socks, Mr. Potato Head socks, Woody socks, and Buzz Lightyear socks all in this set. 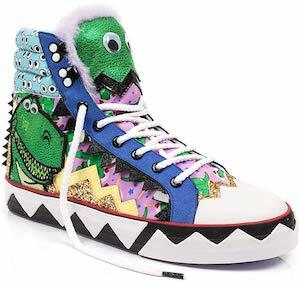 Now you can have fun and colorful socks and even mix and max all thanks to Toy Story. These Pixar socks are made from 75% cotton, 17% nylon, 6% polyester, and 2% spandex so that they are really comfy to wear. 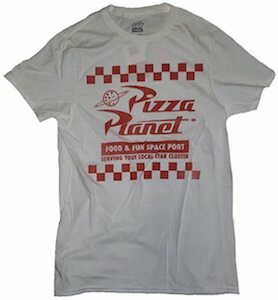 If Toy Story and pizza are on your mind then you want to check out this Pizza Planet mug. 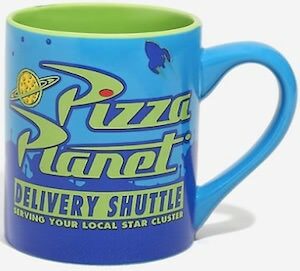 The mug is green on the inside and the outside is blue with on the front it shows a pizza planet and in big letters the text “Pizza Planet Delivery Shuttle” and on the back you can see an Alien picked up the the claw just like you expect at the Pizza Planet restaurant. A fun Toy Story mug like this is great for you morning coffee or afternoon tea but don’t stop there as you can put other drinks in it too and you can even bake a cake in it as it is microwave and dishwasher safe. 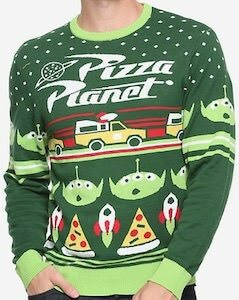 Toy Story fans can now have this pizza planet blanket. 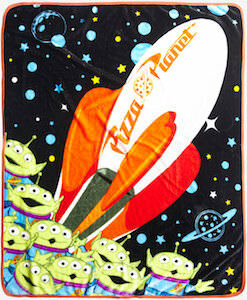 The throw blanket has a black background with lots of stars and planets and in the foreground, you find many famous green aliens and they seem all impressed by the big Pizza Planet rocket that is in between them and the background. The Toy Story blanket is 48 x 60 inches and is great for being warm while watching TV and you can enjoy it on a bed, couch, chair and on the go because you can take it to the park too for a nice picnic that should, of course, include pizza because of the blanket.